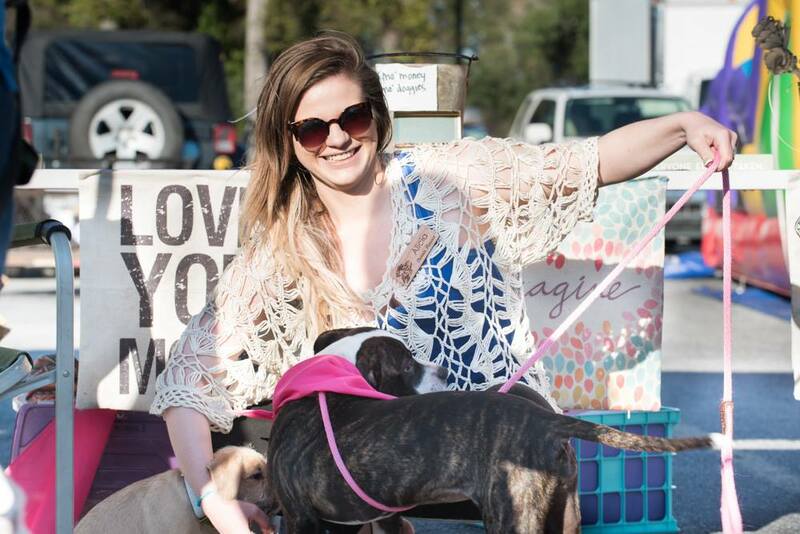 Eunoia Rescue, an organization founded by a member of the Lowcountry Dog Magazine pack – Alicia Williams. This generation of millennials sometimes gets a bad rap, being called “entitled” and often portrayed as spoiled and vacuous in the media. Alicia breaks all those stereotypes with her hard work, passion for saving animals and her drive to do all she can for the rescue community. As for the dogs that find their way into Alicia’s path, they feel like they HAVE won the lottery. Eunoia finds animals that are at risk for euthanasia at shelters all over the state and then places them in loving foster homes. Alicia said, “We tend to pull the animals that have been looked over by other rescuers and/or adopters. Generally speaking, we save the dogs that are “plain” in appearance, emotionally scarred, mixed with a bully breed, and/or past their prime age.” Occasionally they will accept owner surrenders but this is not an ideal situation because one of the key parts of Eunoia’s mission is to teach accountability – caring for a pet even when the going gets tough. They know that at times, situations arise where people have to give up an animal. But it is necessary to distinguish between those times and just giving up on a member of the family. “There is nothing wrong with responsibly re-homing your pet. However, there is a problem with dumping an animal on a rescue or shelter. Animal welfare workers have enough on their plate; the last thing we need is more work.” So before you decide that your cat has scratched up too many chairs or your dog just can’t “get” housetraining, think of the animal that won’t be rescued from the overcrowded shelter and will likely be euthanized because you felt inconvenienced by your pet’s actions. Alicia believes that this type of behavior contributes to the overall problem she is trying to address. She told me “I think there would be [fewer] homeless animals if people weren’t so self-absorbed. Dogs are creatures with souls. They don’t ask to be here and have no say over their life. It takes little to no effort to respect an animal – or at least cause it no harm.” Alicia says she sees many people take a “not my problem” approach when it comes to animal overpopulation and not enough who genuinely care. Even though each and every rescue is important to Eunoia, there are a few dogs that stand out and create a special place in the journey. I asked Alicia about her most memorable story and she told me about Sunshine. “Eunoia’s first rescue consisted of Sunshine and two of her puppies; all of which were owner surrendered to a kill shelter in Columbia, SC. At first, we were only supposed to pull the two puppies and not Sunshine.” Being a brand new venture, she was worried about taking on too much at one time but true to the spirit of the organization, they knew they couldn’t leave Sunshine behind. “[She] came to us with heartworms and a broken soul. She didn’t trust humans and was unsure of how to act around other animals. I was fostering Sunshine myself and it took a solid eight months before someone showed a slight interest in her.” But when Alicia was faced with the possibility of sending Sunshine on her way to a new family, she knew that she just couldn’t break the amazing bond that had formed between them. “I knew I could never let her go. I love this dog so much. She shows me gratitude every day. She’s never disappointed in me and she loves me even on my darkest days.” Sunshine is now thriving and sleeps in a cozy bed next to her mama every night. In my mind, she dreams of squirrels and swimming pools full of tennis balls. If you are interested in helping Eunoia Rescue further their mission, there are several things you can do. Alicia said that their greatest needs right now are foster homes and funding. “If we don’t have either of those things, we are not able to help more animals.” So for each dog you welcome into your home as a foster or each time you decide to donate your money instead of getting a Starbucks latte, you are saving a life that might otherwise be lost. Another way to help is to spread the word about animal rescue. Reposting messages from Eunoia, telling your friends about available dogs and participating in discussions about the homeless animal epidemic are all great ways to help. Alicia says that her hope is “that if more people are aware, then maybe they will want to be part of the solution.” To make a donation to Eunoia or learn more about their adoptable animals, please visit their website athttps://eunoiarescue.com/. I concluded my interview with Alicia by asking her if she had anything else she wanted me to include in the article. She told me: “With the help of so many others, Eunoia Rescue has managed to save over 100 animal lives. However, it started with zero plans/budgets/format. Even though this isn’t the most ideal way to start a business (specifically a non-profit), we’re somehow still making it work. So I guess the moral of the story is: always go for it – especially if going for it includes making the world a slightly better place.” The word eunoia means “beautiful thinking” and Aristotle used it to refer to that undefinable feeling of goodwill and kindness that emanates from certain people. After hearing her parting thoughts, I believe Alicia lives up to the name of her beloved rescue.